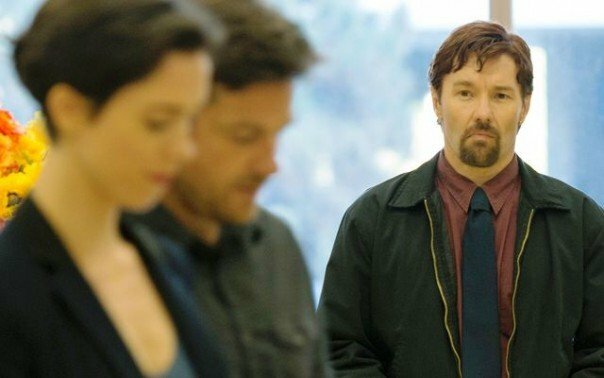 The Gift too effectively plays possum with its first half, but the charade eventually gives way to an unexpectedly smart and twisted thriller. Blumhouse Productions have crafted a thriving horror fiefdom for themselves over the last half-decade, with nearly 20 films released since 2009’s Paranormal Activity. When not pitching in on the occasional bit of awards fare like Whiplash and The Normal Heart, Blumhouse can be counted on for the same sort of entertainment Hammer Films provided half a century ago: modest to micro-budgeted fright flicks dished out by the barrelful, where one hit can offset a dozen misses. The studio’s latest, The Gift, toys with this reputation in some unexpected ways, and ends up being as enhanced by the Blumhouse style as it is hindered. Between The Lazarus Effect, Insidious: Chapter 3, Creep, and The Gallows, Paranormal Activity’s popular trappings (supernatural spookery captured via affordable found footage) have been thoroughly reworked by Blumhouse this year alone. Of the company’s 2015 offerings, The Gift is more in the neighborhood of a suburban thriller like The Boy Next Door. Stalkers, not specters are the terror de jour, with The Gift deploying psychological scare tactics of the sort that drew The Boy Next Door critical derision, but a healthy box office return. The yuppies in for a good startling are Simon (Jason Bateman) and Robyn (Rebecca Hall), married Chicagoans who have just moved to an upscale house near Simon’s childhood neck of the woods. By chance(? ), the two run into Gordo (Joel Edgerton), a high school classmate of Simon’s who’s considerably less well-situated, both financially and socially, than Simon. Robyn, still recovering from a depressive spell back in Chicago, opens her home to Gordo, who quickly insinuates himself into Robyn and Simon’s life in a manner that’s too close for comfort. Over the course of its opening hour, The Gift generates as much tension out of awkward social etiquette as it does creaking floorboards and bad omens. Either way, Edgerton’s work behind the camera as writer and first-time director doesn’t do a whole lot to differentiate The Gift from other movies about unstable interlopers. The constant debating between Robyn and Simon about their new hanger-on gives you ample time to familiarize yourself with the house floor plan, even as blurry photography will sometimes make the movie as engaging to look at as your average found footage film. Save for a few cheap, but undeniably effective jump scares, The Gift makes for a slow burn early on. The false sense of security and familiarity proves entirely intentional. The secrets the movie has in store don’t turn the genre on its ear too drastically, but reveal Edgerton’s game as something much more complex and unsettling than first meets the eye. Like another recent Australian production, 2014’s barely-released Cut Snake, The Gift plays into being a middling version of one kind of movie so well that when it becomes another entirely, the rapid improvement creates a shocking, invigorating sense of momentum. Not that the early limitations weighing on The Gift don’t still hamper it once Edgerton’s script gets to the real meat of the story. At its best, the psychological complexities of The Gift deserve a budget and director that can do them justice visually. The right helmsman guiding you through the fouled waters under a relationship’s bridge can mean the difference between Oldboy and Oldboy (U.S.), the former’s influence seemingly apparent in The Gift’s interests, if not its execution. Plumbing The Gift’s darkest depths becomes the responsibility of the cast, with Edgerton being appropriately creepy as the marble-mouthed Gordo, and Hall doing some fine work, before having to cede the spotlight in the last act. A supporting cast that includes Allison Tolman and Wendell Pierce adds some “that guy/gal!” pep to otherwise functionary roles. It’s Bateman who winds up having to navigate the bulk of The Gift’s left turns, in a role seemingly tailor-made for him as a performer. While usually played for laughs, Bateman’s knack for thinly veiled antipathy gets stripped to its core here. It’s as though Edgerton set out to uncover the buried rage of the beleaguered narcissists Bateman has played most of his career, and both make the most of it. It’s shrewd of Blumhouse to have kept The Gift’s real intentions under wraps, but what audience it’s bound to find likely won’t appreciate how advertising has pulled the old Christmas trick of putting a more thoughtful offering inside the exterior of a flashier one. The disturbing finale will frustrate those without a taste for ambiguity, but only so long as they entertain a possibility upsetting enough to leave a really nasty flavour in your mouth. Edgerton is halfway to a classic here, which is still enough to make The Gift a welcome surprise.